Considering it’s called Cupid’s Undie Run, you best believe we take our undie partner seriously. TomboyX’s gender neutral undies won’t ride up or fall down when you’re running through the streets this February, but there’s more to the TomboyX story than just comfort. That’s why we wanted to sit down with Fran Dunaway, TomboyX’s CEO and CoFounder, to get the full scoop. Cupid’s: Seattle’s obviously known for their coffee, but can you let us in on the best coffee shop in the city? Fran: We have a little shop that’s about a mile away via backstreets. It’s a woman-owned company called Bird on a Wire. We love to walk our dog down there, sit outside and sip our latte’s. They are dog friendly and have free dog biscuits so Maggie loves going there, too. F: Double tall nonfat latte. C: It’s not really a secret that we love undies, and it’s so nice to know that other people are passionate about them too! What inspired you to create TomboyX? F: I wanted a cool shirt! Like a Robert Graham for women. We chose the name TomboyX because we thought it was cute. But when we launched our Kickstarter to pay for the shirts, we quickly recognized that our name was resonating with women and girls around the world. They were so excited to see a brand that was for them. Knowing we had an instant brand, we knew we needed to find a hero product to build the brand around. While the shirts sold out and we had zero returns, we wanted an item that wasn’t about a look but was instead about how you feel inside. When our customers started asking us to develop the first boxer brief for women, we went for it. Turns out we make quality underwear that fits and now we have a full line of styles, from bikini cut to 9” boxers. C: One of our favorite things about Cupid’s is that it really does attract all ages, body shapes, genders… That was a big reason TomboyX stood out to us. How do you make sure that your undies work for all different people? F: When we were developing the brand values for TomboyX it was very important to me and Naomi that we be all inclusive. And that meant we wanted to sell all styles in sizes XS to 4X – at the same price. We also wanted undies that focus on fit and quality so we worked really hard to source the right materials and then fit test the finished product on real customers. Our hard work paid off. We have over 9000 5-star reviews that we are incredibly proud of. C: So, tell us a little bit about the Cupid’s undies you made for us! F: Besides being adorable?! We provided two different inseam lengths, a 6 inch with a button ‘fly’ and a bikini cut. We prefer not to gender our underwear and instead leave it to the customer to determine which style makes them feel the most comfortable in their own skin. We started with using our proprietary waistband that is silky soft, non binding and doesn’t leave a mark. The fabric we used is our luxury micro-modal blend. Made from beechwood trees, this fabric is sustainable and environmentally friendly. The band is incredibly soft and the fabric has a bit of give to it so you hardly even notice you’re wearing anything at all. And of course we added the Cupid’s Undie Run logo for that extra pizzazz. C: So many people who support Cupid’s aren’t personally affected by NF, but they’re excited about the cause anyway. Is that how it was for you or did you know much about NF before? F: I didn’t know much about NF before and had to do some research. We are thrilled for the opportunity to get behind such a great cause and are inspired by the team making this happen. 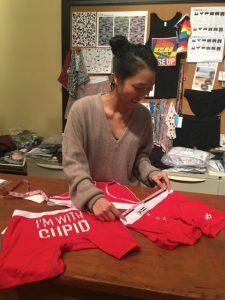 C: Will we be seeing you in undies for Cupid’s this February? F: Me personally? Not a chance! However, we are sending two underwearing proxies in our stead. I’m betting they will run their personal best in the mile as they’ll be attending the Denver run and it’s SO much colder there. Go Team! WHAT- Tomboy is sponsoring and there is no race in SEATTLE!? !